I thought I would never write a defense for a fictional character. Maybe I am crazy, but I thought people gave these creations a chance to grow, to expand, to lose the armor. That's right, I'm defending Joxer the Mighty. Joxer may not be the most suave and debonair of characters, but that is no right to want him to die. That is what many of the most die-hard Xena fans want. Please correct me if I am wrong. But, of course, that was before the episode. Actually, there have two the episodes. Shows that have transformed Joxer from a brainless goof to, oh my gawd, a human being. In his first episodes, most viewers developed the "Oh- it's- a- Callisto- episode- so- that- means- that- gawd- awful- Joxer- creep- will- be- on- so- everyone- get- your- voodoo- dolls- out" syndrome, or OIACESRMRGAJCWIBOSEGYVDO syndrome (OIACES for short). In the past few months, however, Joxer has grown to the point that even the most ardent Joxer-hater has grown soft around his episodes. Some have even mellowed at the mere sight of Ted Raimi's name in the opening credits (others, I hear, still pull out the voodoo dolls). Most of this has been because, unlike his earlier episodes, Joxer has developed a character, one that deserves a chance to grow even further. The writers, who are to be blamed for the unfortunate, fumbling steps that Joxer first walked, have finally figured out Joxer's role in the story. Sure, in the beginning he was a big joke, walking around making cocky boasts that he could not live up to. That was the first seven episodes. He thought he was the greatest warrior alive. 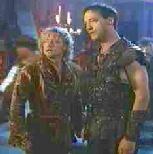 He thought Gabrielle should be his sidekick. But that was before the episodes. When looking at the episodes, one after the other, I have come to the conclusion that Joxer is suffering from what can only be called "Poor Characterization Syndrome," an aliment that comes when a writer knows that he or she wants to use a character but is unclear on just how to use said character. Joxer has become a perfect case of this little known disease. Let's look at the evidence. In CALLISTO (22/122), we were introduced to a klutzy, idiotic warrior wannabe who tried to off Gabrielle. That alone would make most of Xenaphiles to stand up and scream for his head. He was an idiot, one without common sense. The writers obviously wanted a foil to the evil they were introducing in CALLISTO . Thus Joxer was created. For every action there is an equal and opposite reaction. With evil, we get good. With Callisto, we get Joxer. 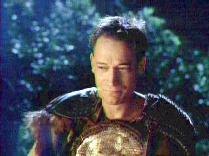 Then came RETURN OF CALLISTO (29/205), another good vs. evil episode, where Joxer again was juxtaposed opposite Callisto. He continued with the Callisto trend through INTIMATE STRANGER (31/207), which demonstrated one of the few instances of Joxer's truly brave nature during this early growth period, and TEN LITTLE WARLORDS (32/208), where the writers developed "Poor Characterization Syndrome," a trend we will see for the rest of Joxer's stay. Because once you have established that Joxer is an idiot, what do you do with him? in TEN LITTLE WARLORDS (32/208). In TEN LITTLE WARLORDS (32/208), we see Joxer as the source of stability. That is not his role on the show. Joxer is not stable, at least mentally. I realize that he was concentrating more and that brought about his apparent transformation into genius, as compared to Gabrielle's descent into madness. The Joxer we saw in that episode was not the one we were accustomed to seeing. Sure, the idiot was still there, but he was also cunning. This was not the Joxer we had grown to hate. In fact, he was starting to become likable. WARRIOR...PRINCESS...TRAMP (30/206) witnessed the return of the old Joxer, a startling difference to the man we had seen in TEN LITTLE WARLORDS (32/208), and the one we would see in FOR HIM THE BELL TOLLS (40/216). THE XENA SCROLLS (34/210) did show that Joxer would survive to father children, or it could be his soon-to-be revealed brother, Jett. Genes do not fall short from the tree, so to speak. In FOR HIM THE BELL TOLLS (40/216), we actually get to see Joxer grow from an irritating idiot that everyone disliked, to an idiot that we could feel sorry for. That is because we see the two sides of Joxer, the one that is and the one that might have been. The one that is a kind, caring soul who looks out for his friends and tries to right. The one, the one that Joxer has pictured himself as being for all this time, is a great warrior whom everyone loves and wants. But was the show progresses, we see the real Joxer realizing his beliefs are a sham. For the first time in his life, Joxer begins to doubt his dream of being a warlord. It is only after Xena's little pep talk that he reverts back to his usual antics. of A COMEDY OF EROS (46/222). But the viewer has to realize that the memory of the other Joxer has to be on the back of his mind and that it may one day cause him to have a nervous breakdown. Why? Because he may realize that even though he may have it in himself to be a great warrior, there is some part of him that will never allow him to achieve his goal. His heart, his conscience and his soul will never allow him to take another life unless it was absolutely necessary. But it may be those things may make him the greatest warrior ever to live. Then, we are given A COMEDY OF EROS (46/222), the second episode to continue to humanize Joxer. We see a mature Joxer, one who, unlike an earlier Joxer who seemed to pounce on any Xena he saw [ WARRIOR...PRINCESS...TRAMP (30/206)], does not make a move on Gabrielle who is under the love spell. His very terse comment to Xena ("If he touches one hair on her head, I'll...") reveals his true feelings for the "irritating blonde." He even has enough sense to realize all is not right with Gabrielle, that or he's scared witless by a woman making such strong overtures. We never actually saw how Meg and Joxer got together (i.e. -- who made the first moves), so we have no clear point of reference. If Meg made the moves on Joxer (could happen, after all, she was the tramp), then Joxer's actions toward Gabrielle could be explained that he subconsciously realized that she wasn't acting on her own accord. If it was Joxer who made the moves, then it could be said that Joxer was afraid of women making strong come-ons. That would be in character, since Joxer is afraid of a lot of things. in BEEN THERE, DONE THAT (48/302). Everyone got what they wanted out of the first few minutes of BEEN THERE, DONE THAT (48/302), the death of Joxer. But the good warrior wannabe died the hero he wanted to be, so how many Joxer-haters hated him even more. Of course, his little speech that ended up killing Xena and Gabrielle, and Xena's subsequent pissed off mood the next day, probably livened up their mood. Again, we have problems with Joxer's character development. He is again the idiot, which is disappointing considering that he demonstrated both brains and brawn in COMEDY OF EROS (46/222). I would have liked to have seen more with him dealing with unrequited love. Perhaps in BITTER SUITE (to be released) or KING OF ASSASSINS (to be released) we will see this. It is important to his character, and has become important to the show to deal with this issue. Joxer is a true hero and fierce warrior. 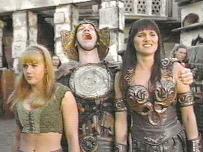 Finally, I would like to point out the recent Hercules episode, STRANGER IN A STRANGE LAND (H64/405). We see a more competent Joxer, one who grew up to be a great warrior. But at what price? The familiar sparkle in his eye was missing, the stupid grin was gone. In their place was a grim figure of a man who would never fall in love with Gabrielle (the assassin-executioner, a strange and symbolic foreshadowing character to future Xena episodes), never ride (or walk) beside Xena, and never be the bumbling fool we have grown to like. I realize that many of those who have read this character analysis of Joxer the Mighty may dislike him even more after this, but look at it this way: in spite of several stumbling blocks in characterization and development, we have seen the growth of a very unusual man. >From idiot to trusted friend, loyal fighter, poor, hurt soul, we have seen his metamorphosis, just as we have seen the transformation of Xena and Gabrielle. We have glimpsed into the heart of a very complex character, who is often at odds with himself whether he knows it or not, and have seen what he could become in the future. I only hope that he remains Joxer the Mighty, the Lion-Hearted forever more.